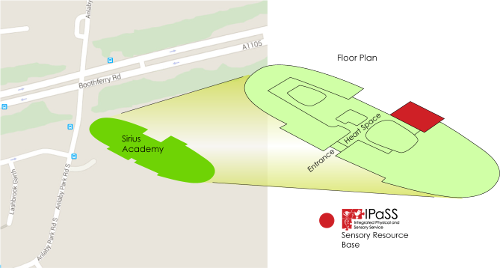 The Resource Base at Sirius Academy is a Hull City Council provision under the direction of IPaSS. The Resource Base is staffed by a highly qualified and experienced team consisting of Teachers of the Deaf and specialist teaching assistants, including two deaf adults who also act as role models for our students and teach British Sign Language up to level 2. The Resource Base is situated in the heart space of the Academy and comprises of a suite of sound treated rooms. These include teaching/tutorial rooms and an audiology room for the effective management of hearing and radio aids. It also has a number of PC's for the students to use. All the rooms have flashing fire alarms. Our main aim in the Resource Base is to develop the language levels of the students in addition to their learning and life skills. We support students with a range of hearing losses using a Total Communication approach. This means we can deliver an individual level of support for every student whatever their degree of deafness or chosen communication method. Some students have hearing aids, others have cochlear implants and some use a radio aid system to help them in mainstream classes. Support, teaching methods and strategies in a Total Communication approach include; British Sign Language, Sign Supported English and Spoken English alongside the students' individual hearing aid technology. Whenever possible, students access the curriculum by attending mainstream lessons alongside their hearing peers, with specialist support by Resource Base staff. Individual and small group tutorials and interventions take place in the Resource Base and are arranged according to need. Students may also be taught literacy and numeracy in the Resource Base, as part of a small group, where they can work quietly and confidently. Where appropriate, and in consultation with our Academy colleagues, reverse integration groups take place. This is when deaf students work in the Resource Base alongside one or more hearing peers. In addition to students supported by Resource Base staff, there are a number of hearing aid users within the Academy who may access the facilities in the base if they wish. The Resource Base has established close working links with a range of agencies who work with the students. These include specialist careers advisors, NDCS, CAMHS, Educational Psychologists, Physiotherapists and both the Yorkshire and the Nottingham cochlear implant centres. Many of the students have weekly sessions with their specialist speech and language therapist, who also sets work that is carried over by Resource Base staff. Once a week the students attend a tutorial in the Resource Base. These tutorials can be used to deliver information about topical issues, for example, healthy living or developing self-esteem. It is also a useful time for the students to develop their social and communication skills. As the students start in year 7 they are assigned to a teacher who will act as their 'key worker' or mentor. This provides parents and guardians with a point of contact. It also allows the students consistency and the chance to build up a positive relationship with their Teacher of the Deaf. Students have access to the Resource Base computers at lunch times and breaks. At these times Resource Base staff are available to help with homework. 100% of students in years 11/12/13 secured places at further education Colleges or employment.